That brisk kiss to our mountain air is back. For those of us who call Lake Tahoe home, this is the time of year that we all long for and it makes us very, very excited. This touch of love from the crisp air is beautiful because it means one thing: snowfall is right around the corner. For one local in particular this is an especially important time of year; cooling air means that his business is soon to rev up its adrenaline-filled engines. 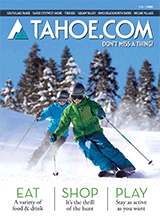 Dave Rintala – otherwise known as Happy – is a longtime local as well as the owner and operator of Pacific Crest Snowcats, one of the best ways to get out and enjoy skiing or snowboarding the backcountry of the Sierra Nevada. An impressive cat-skiing operation that serves up some of the best riding you are going to find anywhere around Lake Tahoe (and quite possibly North America), Pacific Crest Snowcats has gained the reputation of providing ski trips that match up to dreams. 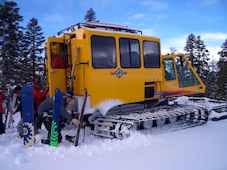 As an avid, lifelong skier, I was incredibly excited when I was able to connect with Dave and ask him a few questions about Pacific Crest Snowcats and the wild ride it has taken him on while living in Lake Tahoe. Continue on and plunge into the world of steep skiing. Please share how Pacific Crest Snowcats came about? It was a typical late start to the season and while creeping back on some jeep roads to look for accumulated snow to backcountry ski, I found a steep and protected north-facing area with a great deal of snow and amazing powder. Upon realizing that an antiquated road network made the area accessible by snowcat, I began a research phase and ultimately gained access to the private land and started the operation with a 1963 Thiokol snowcat. I was, at the time, a helicopter ski guide in Alaska and before that a professional ski patroller at Squaw Valley, so my background matched my vision! We began operations nearly two decades ago and since then we have earned the reputation of having the best expert snowcat skiing in North America. How did playing in the mountains of the Sierra Nevada influence you in creating Pacific Crest Snowcats? The Sierra range allows for great steep skiing, better than anywhere in the United States, south of Alaska. This is due to the maritime snowpack, which promotes stability as well as amazing snow deposition – turning our steep mountains into playgrounds! Our area at Pacific Crest Snowcats is exceptional for an additional reason, which is volcanism. Due to the erosive nature of the volcanic terrain, we have fluted bowls, steep-flanked chutes and labyrinthian fins and balancing rocks perched above the slopes. These terrain features help preserve powder, protecting it from the sun, while making the landscape visually stimulating and engaging for the senses. Our "secret stash" is located on the lee of the Pacific Crest and holds some of the coldest, deepest and best-preserved powder that I have seen in my vast travels in the Sierra. We typically are skiing fresh powder for ten days or more after a storm! What type of terrain are you accessing with the snowcat, and can you describe an average day out on the mountain? We have seven zones, each with its own character. Although we have moderate slopes suitable for all who are comfortable in powder, we are known for our steep north-facing bowls and chutes, which bring our local regulars back many times each season. In fact, we have some clients who ski exclusively with PCS, leaving the ski areas behind in the quest for quality. We run two modern snowcats throughout the season. Our typical day is 8 to 10 runs, with more possible depending on the conditions and group dynamics. We stop at a scenic spot for a full lunch before skiing the remainder of the day. Every trip is an adventure that begins with a safety briefing and a warm-up run before moving back into the remote reaches of our terrain. Nearly every day we are able to find great conditions – thanks to runs spread over 360 degrees of aspects. What advice do you have for a novice skier that is interested in exploring the vast backcountry? I would suggest that they first become comfortable skiing powder at the ski resorts. And to do so, I highly suggest fat skis! Once they are seeking out the powder at the resorts, they should join Pacific Crest Snowcats for their first backcountry adventure. 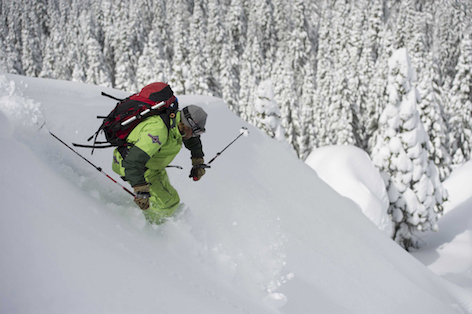 With us they'll learn the basics of backcountry safety, including how to use an avalanche beacon. They'll learn about potential hazards and how to avoid these hazards by making educated decisions about how to approach terrain. After a trip or two, they should join Pacific Crest Snowcats for one of our educational trips. These include short educational talks in the snowcat and discussions at the start of each run about specific terrain features. We get nearly the same amount of skiing in on these days, but our guests go home with a wealth of information gathered from more than 30 years of ski-guiding experience in the big mountains of Alaska and elsewhere. Do you recommend any training or education for skiers or snowboarders before they venture out with you? Experience skiing and riding in powder is the key. Formal training is not necessary at all. Most of our clients have not had any training beyond what they receive from Pacific Crest Snowcats. Can you share a favorite experience that you have had with Pacific Crest Snowcats? Every day is special, but some days are deeper, or steeper. And the private snowcat groups of local expert skiers are some of my favorites! I also love taking out the professional skiers and Olympians from around the world. Every trip is different, and every group adds to the experience. Regardless of the specifics, there is nothing I would rather do than ski the backcountry by snowcat. Some of the greatest times we have are the storm days, when the ski lifts are closed and the resorts are buttoned up tight, and we're still getting to the deepest powder of our lives in the comfort of a heated snowcat! Please share any upcoming events you would like to share with readers. This year we are offering special two- and three-day packages, including lodging and all meals for up to eight people in our backcountry cabin. This stream-side cabin is ski-in and snowcat-out and allows us to get into the deepest and best terrain and stay there for multiple days. Your guides become your chefs and cook delicious meals while you enjoy drinks by the campfire and watch the sunset. Morning comes with a hot breakfast and then it's right to the top of our very best terrain where we play for the entire second or third day. The cost is comparable to getting a hotel room between ski days, so it's a deal that can't be beat! Additionally this season we're offering the Expert Upgrade, which allows access to more runs, steeper terrain and a quicker pace throughout the day. It's a great way to log more vert and enjoy camaraderie with like-minded guests and the pow-hungry PCS guides.